How many plumbers does it take to install a sink? Seven. One to do the work, three to supervise, one to get the coffee and two who showed up when the donuts arrived. We’ve all been on job sites where it seems as if nobody’s in charge and everyone is waiting for something before they can start work. The University of Michigan conducted a study that found the average time lost waiting for equipment, materials, tools, and information was about 83 minutes for plumbers, 62 minutes for carpenters, and 45 minutes for bricklayers. And there are other kinds of waste. The U.S. National Association of Home Builders (NAHB) estimates that about 8,000 lbs. of waste material goes into the dumpster during construction of a 2,000 square foot home. The industry can be inefficient. This has come under the spotlight partly because of the drive to save energy, recycle more, and reduce landfill, but for financial reasons too. And we all know what happens when the moneymen get restless. If it was every industry it might be seen differently, but according to New York headquartered global management consultants McKinsey & Co., in the past 20 years the global average for value-added per hour has increased four times as quickly in manufacturing as it has in construction. Worse, in North America, construction productivity has declined significantly. This has caused large players in our industry to take a hard look at planning, designing, scheduling and waste. 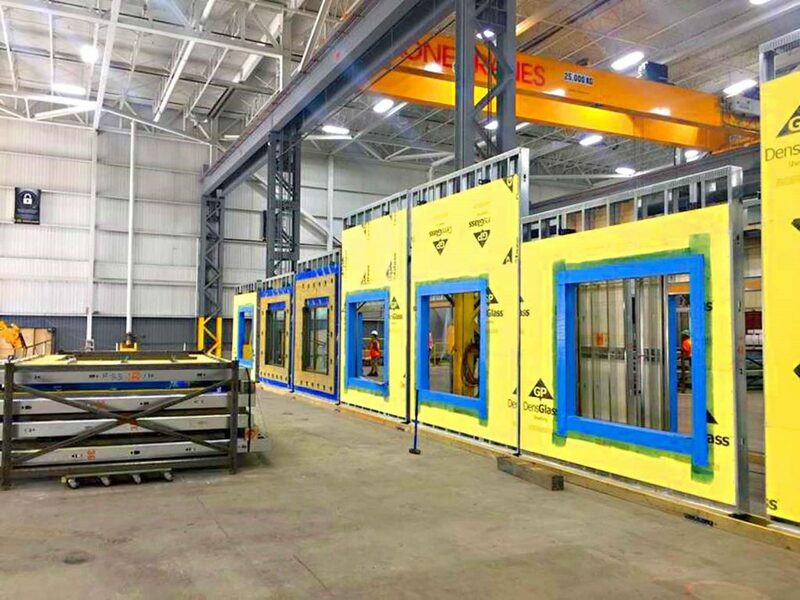 Some have concluded that prefabricated building modules can help alleviate problems. Prefab has been talked about for decades and tested sporadically with mixed results, but there is evidence that it might be catching on a little more now, for particular niche applications, or perhaps even more broadly. Technavio, a global market research company, reports that the global prefab construction market was about $79 million in 2015 and could exceed $110 million by 2020. It is forecasting about seven percent growth each year for at least five years. The Marriott Hotel Group has completed one hotel and is working on four more using prefab bedrooms and bathrooms. Among other things, this reduces the construction time about 30 percent. In 2015 a seven-storey apartment building in Manhattan was assembled in 19 days after 56 modular rooms arrived from a factory in Pennsylvania. These were successes. There have also been failures. Again in New York, a new prefab company agreed to supply modules for 15 buildings on the Pacific Park megaproject, but totally obliterated the construction schedule, filed for bankruptcy and lost the contract before the first building was complete. Its assets were later purchased by a better management group that now runs a successful construction prefab business. In Canada there are several prefab companies pre-building hotel rooms and other modules in Quebec, Ontario and elsewhere. PCL Construction pre-fabricates wall panel systems for commercial buildings, hospital washrooms, construction offices, maintenance buildings and large electricity battery containers on solar farms in its Etobicoke, Ontario plant. The company recently pre-built 294 bathrooms for a new hospital project in Toronto. Insulated plumbing and electrical systems, drainpipes, shower, shower curtain, toilet, grab bars, sink, faucet, heat lamp, other lighting, occupancy sensor, GFI, and nurse call button were all pre-installed into each module and pre-tested in the factory. In the middle of winter, they were shipped to the jobsite on a flatbed truck, four modules at a time. Once there, they were craned into position and connected in a fraction of the time it would take to create equivalent stick-built washrooms. The crane lifts the nine-foot tall bathroom to the edge of the roughly 16-foot floor where it is needed. The plumbing contractor then uses a pallet jack to wheel the unit into position. Four workers, one at each corner, simultaneously crank it down into the slab depression using trailer-jack-type devices. The plumber then adds extensions for the water lines and drain stack. The water lines are on top and safety rules require that after he climbs up, he has to be tied in. The bathroom unit above has a hook precast in the bottom of it so he can quickly clamp on his safety rig. The benefits for plumbers and other workers are the main discussion at the PCL factory. Given that most of the work is done there rather than on the job site, working conditions are safer, healthier and more comfortable for a greater proportion of the tradesperson’s time. Wall modules for a seniors home were built in the plant. The weather supports his comments. Outside it’s about 6oC (45oF), snowy and slushy, while everyone is warm, relaxed and smiling inside the prefab factory. The plant manager shows off the plush plumber’s offices, dining area, exercise room, and so on, to underscore the numerous factory-built advantages. But it’s not necessary. The economic and schedule advantages of prefab are compelling on their own. Every recent North American example shows cost savings of at least 25 percent and LEED points for reducing waste. Managing and recycling material is simply easier in a factory environment than on a job site; where perfectly good leftovers are often destined for the dumpster. In addition, the system is better for quality control. Fleetwood offers the example of an adhesive that dries better in the controlled climate conditions inside the factory. He talks about improved welding, easy access to designs on computer screens, less re-work, a relaxed but efficient assembly line approach, economies of scale, and less energy consumption. Building Information Modelling (BIM) programs are used to ensure the modules will fit properly into the building in question and that adequate installation time is slotted into the project schedule. Everything is more precise and efficient. The company also recently supplied all the insulated exterior wall panels for a four-storey seniors home, with the windows pre-installed and sealed properly. Seventy percent of the walls in the building were built this way, shaving two months off the schedule. PCL also provides offices, maintenance buildings, helical piles and battery container rooms for solar farms. In one case they created the office and outbuildings in three sections, including pre-installed windows, doors, heating, cooling, electrical and pre-plumbed kitchen and bathroom. They connected them together on the shop floor and pre-tested all the systems, then unhooked the three sections and shipped them by truck to the site. They also pre-fit large numbers of lithium batteries into sea container rooms, then ship them to solar farms to be used as temporary electricity storage. Sea containers are a particularly suitable starting point, given their structural strength and the fact they are designed to be transported from one place to another. There are probably just as many coffee and donut breaks on the job site as there were before, but now they are part of a carefully mapped out pre-planned schedule. And six of the seven plumbers are back at the shop.